vineyard vines, the lifestyle apparel brand best known for its smiling pink whale logo, announced a partnership with Multi-platinum, GRAMMY award-winning artist Zac Brown in his role as co-owner of DemerBox. 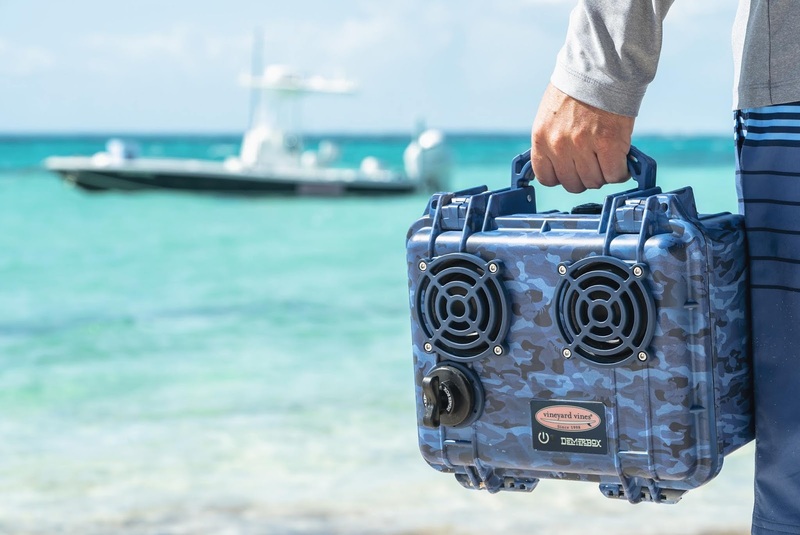 DemerBox Speakers, a Bluetooth wireless speaker best known for its indestructible, waterproof world-class pelican case and 50-hour battery life, will now come in two custom vineyard vines patterns – patchwork and blue camo. The same patterns will also be available in coordinating trucker hats. This exclusive collaboration will launch November 28 at vineyardvines.com and in select stores nationwide and retail for $399.00. "This collaboration is a natural fit for us. We met Zac over a decade ago while fishing and bonded over our passion for music and being out on the water," said Ian Murray, brother and co-founder of vineyard vines. "When Zac gifted each of us a DemerBox this past summer we knew it was something that aligned so perfectly with our brand and the 'Every day should feel this good' lifestyle," adds Shep Murray, brother and co-founder of vineyard vines. "We are excited that they will now come in two of our favorite patterns." "I carry my DemerBox with me everywhere I go, it's super tough and sounds amazing. We're excited to partner with our friends at vineyard vines to create these special edition Demers," said Zac Brown. For a complete look at the vineyard vines DemerBox collection, please visit vineyardvines.com or follow along @vineyardvines and #EDSFTG.